sailboat. 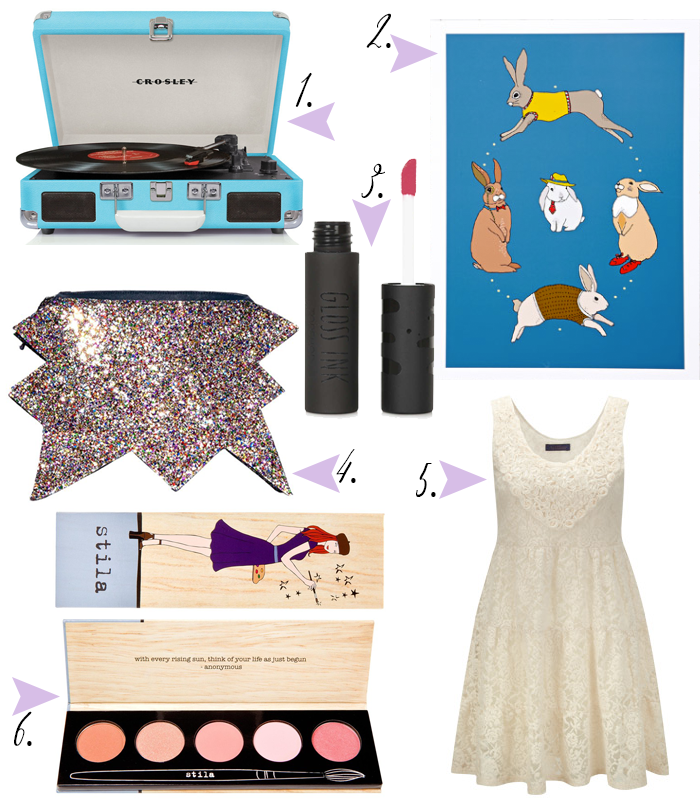 : Some pretty things: a lace dress, a sparkly clutch and a beautiful record player! Some pretty things: a lace dress, a sparkly clutch and a beautiful record player! There's one thing on this list that I'll actually need (well, not need but it would be useful!) very soon and doesn't just fit into the oh-my-gosh-this-issooooo-cute-i-need-this-in-my-life-but-i-dont-really category! I bought a record the other day, yep, even though I don't currently own a record player. I'm not really sure why I did, I could have just bought the CD but there's something way more appealing about the aesthetic & the sound of vinyl. I'm going to start my own little vinyl collection that's only full of albums that I absolutely adore. There are so many record players to choose from and the one that's currently catching my eye is this very cute Crosley Mini Cruise Turntable. I don't know if it's the one I'm going to go with, but it's a contender! Everything else on my list are things I stumbled across on the internet this week and I think are so cute and/or really pretty. This Stila Cheek Palette looks beautiful but please no one let me buy it, even though the packaging does look utterly adorable! The Topshop Gloss Ink's have been popping up on a lot of my favourite beauty blogs so naturally I'm lusting over them for myself. Again, someone tell me no - I don't need any more lip products...even though I am really enjoying glossy finishes right now! No, don't let me buy one! Pretty cream lace gets me every time and I also really love the whole tunic and comfy leggings combination because I think it's the perfect outfit for feeling really comfortable but also looking like you've made at least a little bit of an effort! So this little Joe Browns Lace Tunic is calling my name. House of Holland isn't really a brand I find myself looking at very often but as I was scrolling through the new in section of ASOS my eye was drawn to this amazingly sparkly Starburst Bag. Ohhh it's a beauty! And, I mean, who doesn't want a print of bunnies wearing jumpers, shoes and monocles?! Is there anything you stumbled across this week that you would really love? Also if you have any record player recommendations, that would be amazing! I want to start my record collection too, but not having a record player stopped me. And every single time I go to charity shops I can't stop myself from browsing the record collection. That dress is beautiful - I love Joe Browns!! My brother has a mini record play and my dad has a really old one! Records are all over my house because of them but I really love it :P I think my brother got his off amazon and its really great! We used to have a really old record player and every weekend my dad would play his old records on it - a lot of Frank Sinatra and Tony Bennett, so I have some very fond memories of record players! You truly have a lovely blog! I'm so intrigued by the Topshop gloss inks, I can't wait to try them! TUrntable! That is ever so pretty. We currently have my parent's old record player from the 70s set up in the living room. However the speakers and the cables are also from the 70s and I manged to break the connectors so I need to fix that. I just love having a record playing, the sounds is beautiful. I hope you enjoy it! Ahh, this record player - I'm in love! That record player is ADORABLE. My roomie has a record player and she's started a small collection of records and it always makes me want to do the same but I don't think I have the space. I'm bad enough with CDs. One day though, when I have my own place, it will definitely be on my wish list. Aaah, such beautiful things! I absolutely love the record player, and of course the Stila cheek palette! That turntable is sooo cool. Really want one now! I love the turntable my mum has loads of old LP's that could be played on this gem and the Stila palette they are really lovely colours. You already saw the Thinking Mug that I found, but I also have my eye on some amazing chopping boards (http://www.notonthehighstreet.com/theoakandropecompany/product/personalised-chopping-boards). Love their chunkiness!